Love it. We all have to deal with a lot of that "stuff" in life no matter what job we have or want. Good to learn early to "deal with it and move on". Love and blessings to all. She loves it. 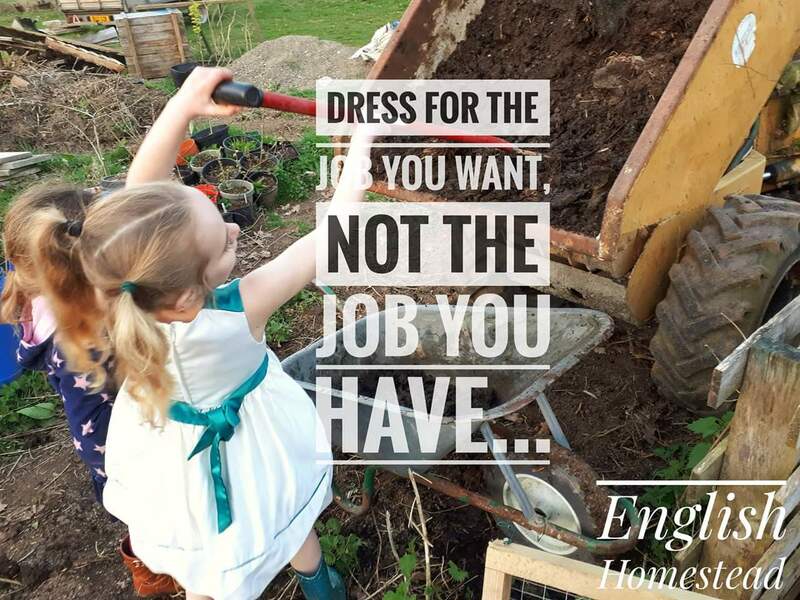 Always dresses like that if she has the option - no matter the job! Modern ladies can do anything, even sling muck and look glamorous doing it. This picture made my day. It should be put on a coffee mug. The oldest and I are turning over the garden today and neither of us look clean at all. She didn't look clean after this I can tell you! That dress has been through it all. She wears it at least once a week! A lady has to have standards! I put a swipe of lipstick on to take the bin down to the road. You never know who you might see! Haha! Men have it so easy in comparison. I never even brush my hair! Hi, Thanks! I checked out his stuff but the one plant he recommends won't grow over here unfortunately, or only in the summer. I could do with one that would dry for use over winter really I think.